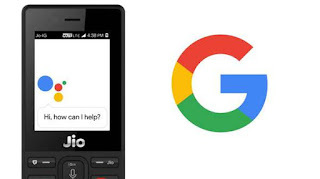 In a move to empower feature phone users in the country, Google on Tuesday announced to bring its Voice Assistant on Reliance JioPhone. The Google Assistant for JioPhone will be available in English and Hindi, the company announced during an event here. This is the first time Voice Assistant will be available in any feature phone. The 4G and VoLTE-enabled JioPhone was launched on July 21 which is available free of cost with a deposit money of Rs 1,500. Aimed at over 50 crore feature phone users, the 2.4 inch device has 2MP rear camera and houses 2000mAh battery. The JioPhone has a single Nano-SIM slot and a microSD card slot. According to industry sources, Jio carries more than 100 crore GB data per month.